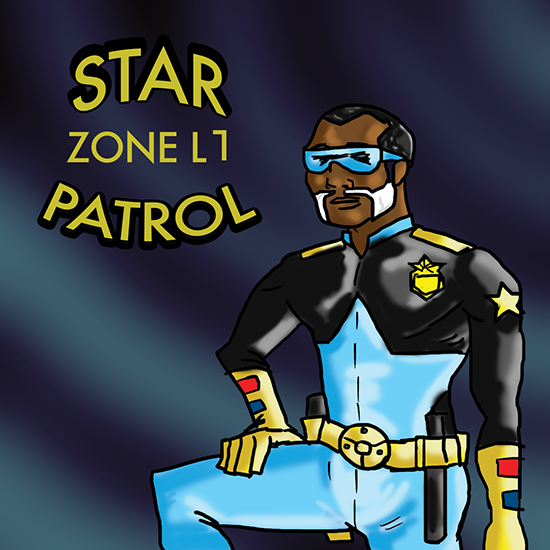 I may have mentioned that I am a member of the forums on Comic Book Resources. 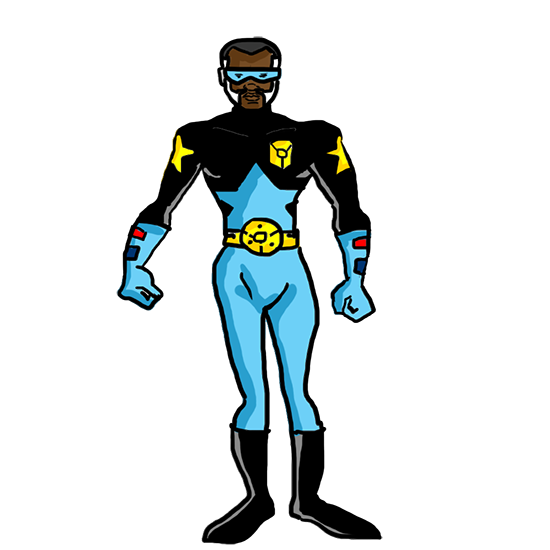 There’s an annual Super Hero design/redesign competition on the Artist and Writer Showcase section of the forums called Project CBRunway and this is the 7th “season.” I’ve participated in the competition a few times and it’s something I look forward to every year. 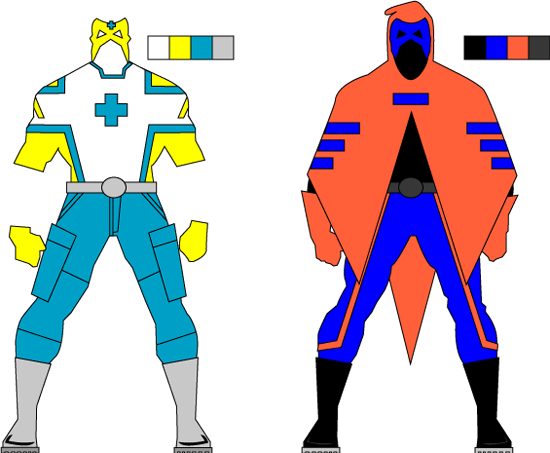 This year hopeful participants had to submit basic costume designs for a hero and villain based on ourselves using a basic template model sheet. I went with the basic themes of positivity and negativity because these are drives and attitudes we all share, but when the mood shifts too far in one direction, you aren’t behaving like your normal self. First I got to work on the positive aspects using the mathematical symbol for plus(+) as an insignia and using bright colors, baby blue, white and yellow to show a positive attitude. And I used the minus(-) sign for the villain and inverted the colors on the computer to come up with that color scheme. Anyway, here’s my submission. Private Positive and Negatory. Great, right? MattBib, the moderator of this section of the forums acts as Tim Gunn and gives us wild ideas for our weekly challenges. For the first challenge he came up with the name “Sounds of the Silver-Age” wherein the contestants had to pick an iconic Recording Artist from the 1960s and give that person a super hero costume from the silver-age era of comic books. Comic Book scholars and collectors understand the silver-age to be the period between the late 1950s to the early 1970s. In this period comic fans were introduced to the updated versions of the Flash and the Green Lantern over at DC Comics and Spider-Man, Iron Man, the Fantastic Four… well let’s say just about all the really popular characters over at Marvel Comics. The Flash went from Jay Garrick to Barry Allen, Green Lantern from Alan Scott to Hal Jordan. This Explosion of Characters came from what Stan Lee likes to call the Marvel Age of comics. 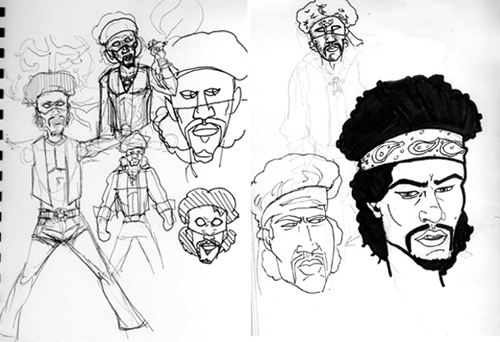 That’s what comics looked like in the Silver-Age, and as for the Music Icon from the 60s, I chose Jimi Hendrix. His look lends itself to the fantastic automatically. His dress was that of a gypsy pirate, with an attitude to match. Hopefully I don’t have to give him too much of an introduction, I’m guessing enough of you are experienced. With that bravado and cockiness as fuel I began sketching out his look. I tried bell bottom pants for him and frilly cuffs for his shirt sleeves but that was still saying Rock Star and not Super Hero. The one thing from his signature look that I could borrow from to make him a super hero was his bandana. 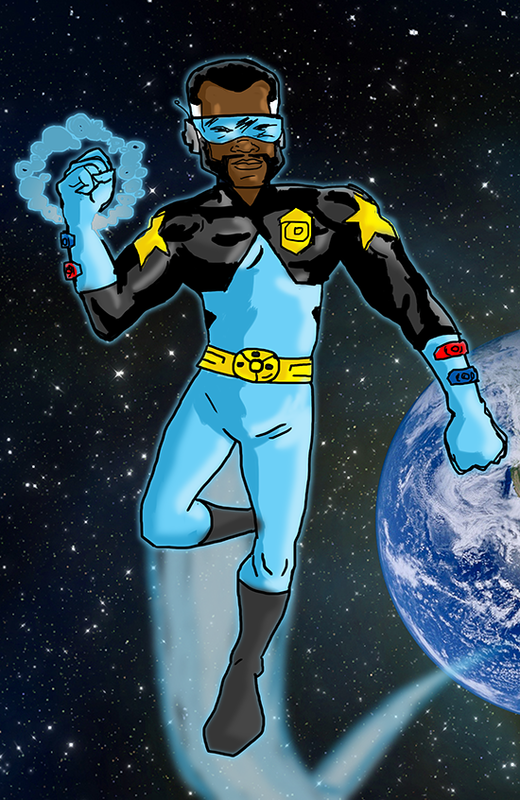 I just rolled the headband down over his eyes and added some goggle lenses and boom, Super Hero. But nothing really came to me though that said Voodoo child and the Internet wasn’t working so well, so researching the symbolism of Voodoo wasn’t going to work out. Also I couldn’t get the Marvel character Brother Voodoo out of my head. Below are some rough ideas/sketches. 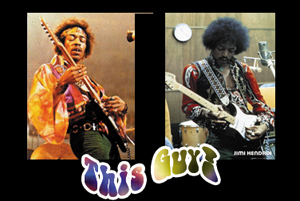 Hmmm, none of these really say "VOODOO CHILD." Voodoo Child wasn’t working out for me as a character and I didn’t have much time to work because the deadline for this challenge was creeping up on me. For some reason I considered Purple Haze. Time was working against me, so I threw together a quick simple cartoony sketch on some Borden and Riley vellum paper without a solid character model and design to work from. As simple as it was I really liked it. I was watching Adventure Time so that world of mirth and excitement may have slipped in and made me feel good about everything. It’s kind of like what I’d imagine an LSD trip to feel like. So from the sketch it was scanning time, soon to be followed by some coloring in PhotoShop. Here are the results. When working on a character with a purple color scheme, avoid using red.GARISH!!! I could have gone down the coloring road all night, but it was late and I had to get this in on time for the voting thread to go up. To me A was too much like the Wonder Twins. B was a step in the right direction and C was a step in the wrong direction, ugh. D although it’s basically a simple color swap of A really made things pop for me. It’s what I went with for the challenge. Check out the Project CBRunway: Challenge 1 voting thread and check out the other entries as well. If you’re inclined to vote I won’t stop you. The voting poll allows you to vote for multiple designs so no pressure. 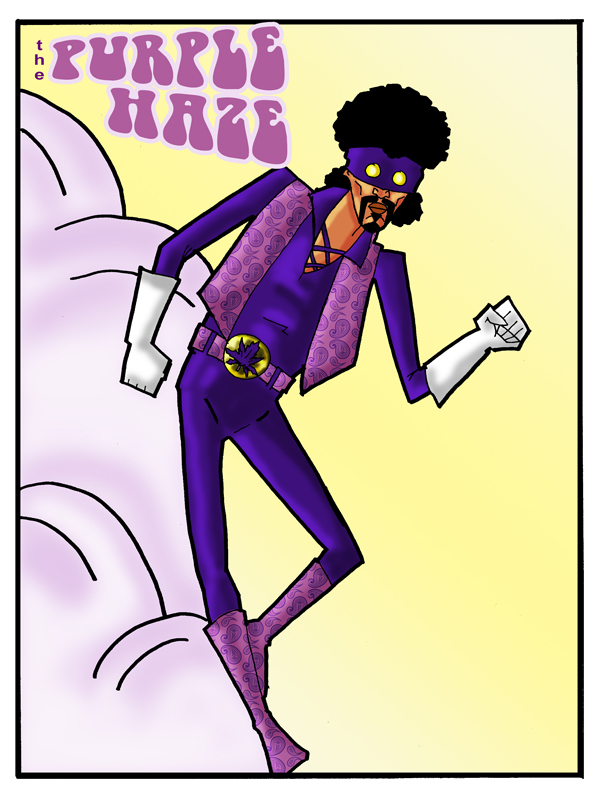 And just for my Ungowa Soul Power visitors here’s a slightly modified image of Jimi Hendrix, The Purple Haze. Acting Funny, But I Don't Know Why?!? Excuse Me As I Kiss The Sky.